What is ESSP? How Does It Differ from Traditional Full-Season Soybeans? 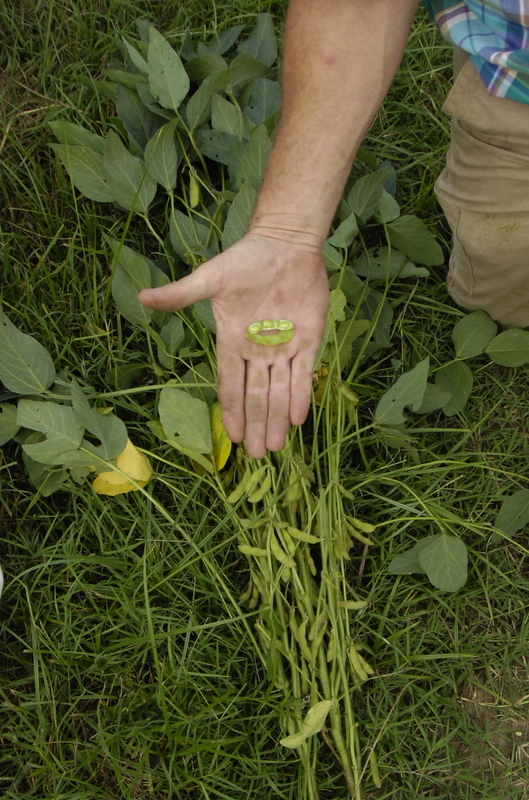 Traditional soybeans for south Georgia involve determinate varieties that are usually planted mid-May through early June, cultured through the summer, and harvested in early fall. Determinate varieties are very photoperiod sensitive, they have a distinct vegetative growth period (that lasts until late July-early August) that is followed by a distinct reproductive (pod development) period. Maturity date of determinate soybean varieties, adapted to South Georgia, ranges from late September to late October. The growing season for adapted determinate varieties is usually 145-160 days. These varieties usually grow and yield poorly if planted before early May. In contrast, ESSP for South Georgia involves planting early maturing indeterminate soybean varieties (MG 4.6-5.0) in late April or early May. These varieties are also moderately photoperiod sensitive, but after the first 6-7 weeks, they grow both vegetatively and reproductively at the same time. ESSP varieties adapted to South Georgia mature late August through early September. ESSP varieties usually begin flowering in early June and pod fill by mid-June; their total growing season is usually 120-135 days. With good cultural practices, ESSP may out-yield traditional determinate soybeans 10-20 percent or more. Market price of ESSP or other beans delivered to local elevators before mid-September may be $0.50-$1.00/bushel higher than price of later deliveries. Early planting, select varieties, close rows, pre-plant nitrogen, irrigation, harvest aid, and timely harvest, along with all good basic soybean cultural practices, are needed for high ESSP yields. 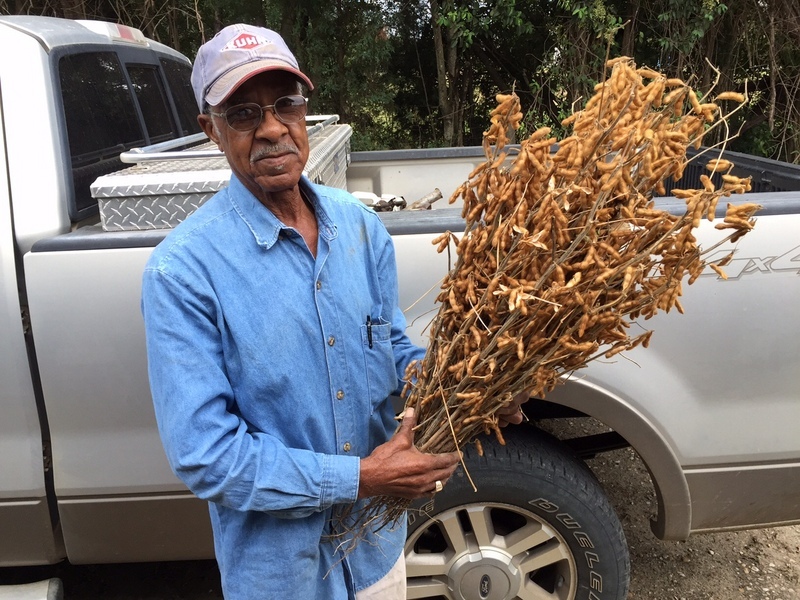 Poor seed quality can be a critical issue if ESSP beans are not harvested soon after maturity. Use Good Crop Rotation and Productive Soils: A weakness of most ESSP varieties is lack of root-knot nematode resistance. Planting ESSP beans in fields which are below economic thresholds of root-knot nematodes is critical to achieving high yields. Field history of nematodes should be taken into consideration and fields in question should be sampled for root-knot nematodes. Those with significant root-knot populations should not be planted to ESSP beans or should be treated with fumigant nematicide. ESSP beans should be grown on fertile, productive soils. 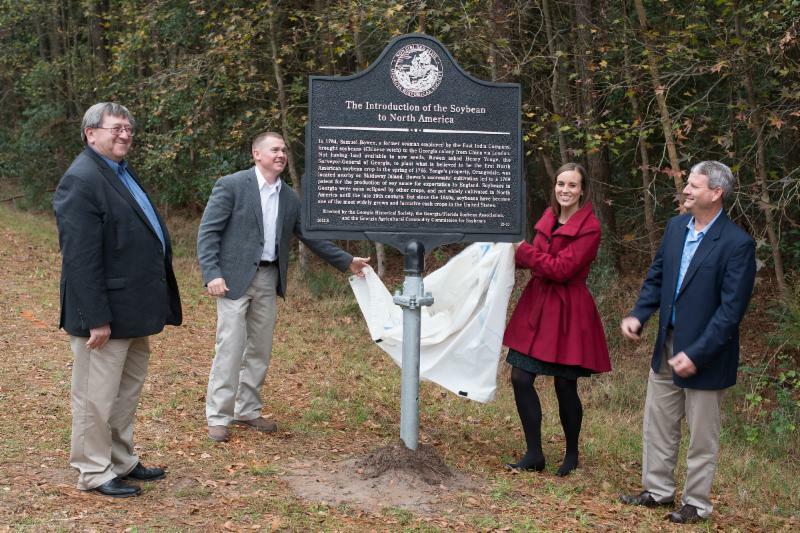 Avoid ESSP on eroded clays, deep sands, and poorly drained Atlantic Flatwoods soils. Fertilize for High Yields: Start with a soil test. Lime, if needed, to get soil pH to 6.0-7.0. In addition, seek to get soil calcium and magnesium levels to 1200 and 400 lbs/A, respectively. Based on soil test results, apply enough phosphorus and potassium to raise these to high soil test levels. To stimulate early season soybean growth, apply 30 lbs/A pre-plant nitrogen. 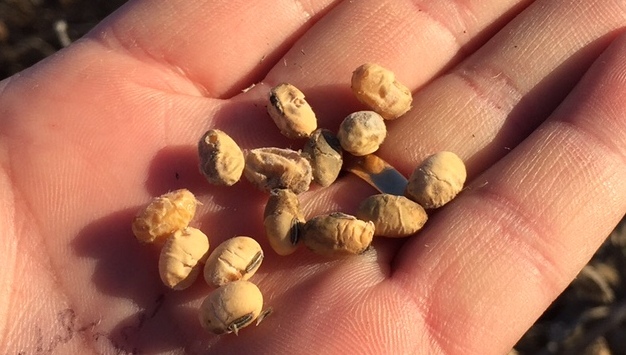 If soybeans have not been grown in recent years, apply a viable soybean nitrogen-fixing bacteria inoculant, either in-furrow or as seed treatment. Apply 10-20 lbs/A sulfur for soils with less than 1 ½ percent organic matter. For sandy soils, plan to apply ¼ – 1/3 lb/A boron as a foliar spray at beginning pod fill (R3). At beginning pod fill, around mid-June, begin collecting soybean leaf samples (uppermost fully developed leaves) weekly for tissue analyses. Monitor especially the potassium level. If this drops to a low level (below 2 percent) by late July or early R5 (full bean stage), a supplemental application of potassium may be beneficial. 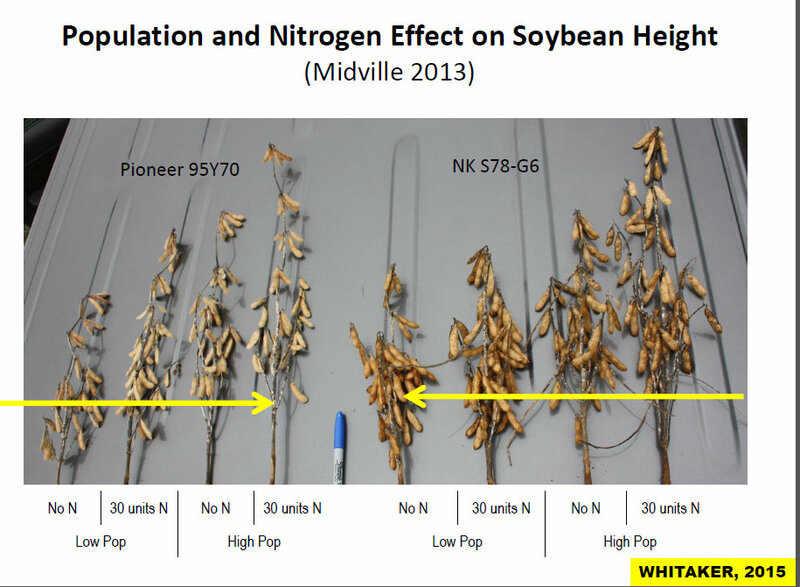 A supplemental application of nitrogen at this stage may also be beneficial if striving for high yields (80-100 bu/A). Plant in Close Rows: The objective should be to get full canopied soybeans (those with a leaf area index of 5+). When following above practices, this can usually be accomplished with row spacings of 30 inches or less, or by planting in twin rows if planting on a 36 inch bed. Till to Get Deep Rooting: If not using long term no-till, use in-row subsoiling or some form of deep tillage to help insure getting deep rooted soybeans. Care must be taken not to re-compact soil during seed bed preparation, planting and culture. For many farm operations using twin row planters with in-row subsoiling (on a 36” bed) may be the best way of getting the benefits of close rows and avoiding soil re-compaction. If planting in close rows (less than 24”), field traffic lanes should be established to minimize compaction and soybean plant destruction during field traffic operations. Plant 140-150 Thousand Seed/A: Adjust planters to plant 8-10 seed per foot for 30 inch rows. 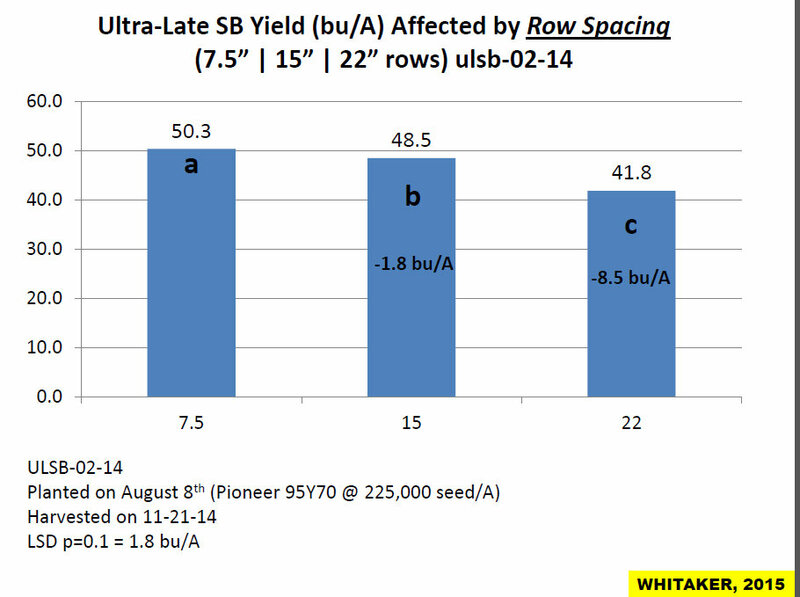 If planting in closer rows, adjust seeding rate per row downward according to row width. If planting a tall growing variety, use the lower seeding rate. Be careful not to overseed, as this can result in lodging and reduced yield potential. Seed should be placed 1-1 ¼ inches deep in moist soil. Irrigation may be needed to help insure getting a good uniform stand, and/or to activate preemergence herbicide. Plant Before May 15: In order for ESSP beans to have high yield potential, they need to be planted before mid-May (April 15-May 15). Planting date studies have given variable results, depending on the year and location, but best farm successes usually occur with April 20- May 1 plantings. Make sure soil temperature (2” depth) has warmed to at least 68° F before planting. Planting too early may result in reduced vegetative growth and poor seed quality. 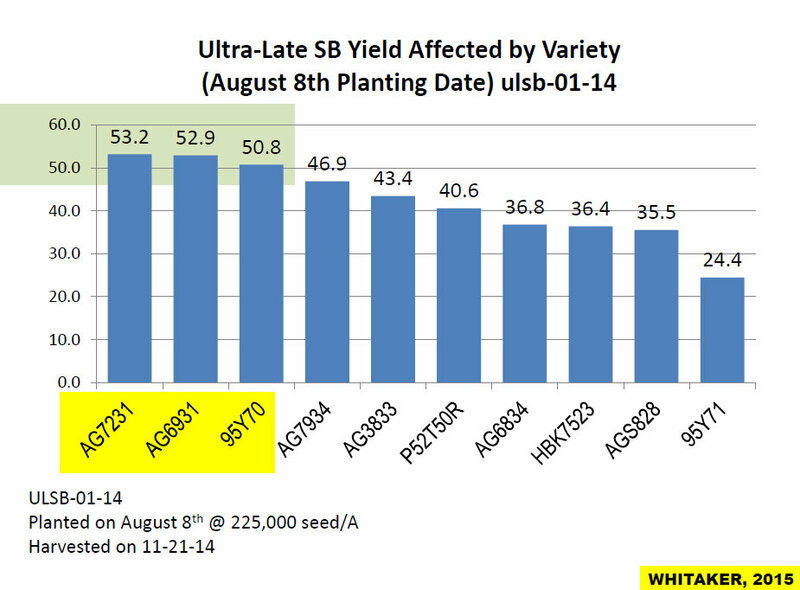 ESSP beans appear to have no yield advantage over traditional determinate soybeans when planted after mid-May. Seed should be treated with a fungicide when planting in mid-April or cool soils. An in-furrow fungicide may also be beneficial when planting in adverse conditions. Select ESSP Varieties Known to Have High Yield and Good Seed Quality: Getting the right ESSP variety is crucial to success. 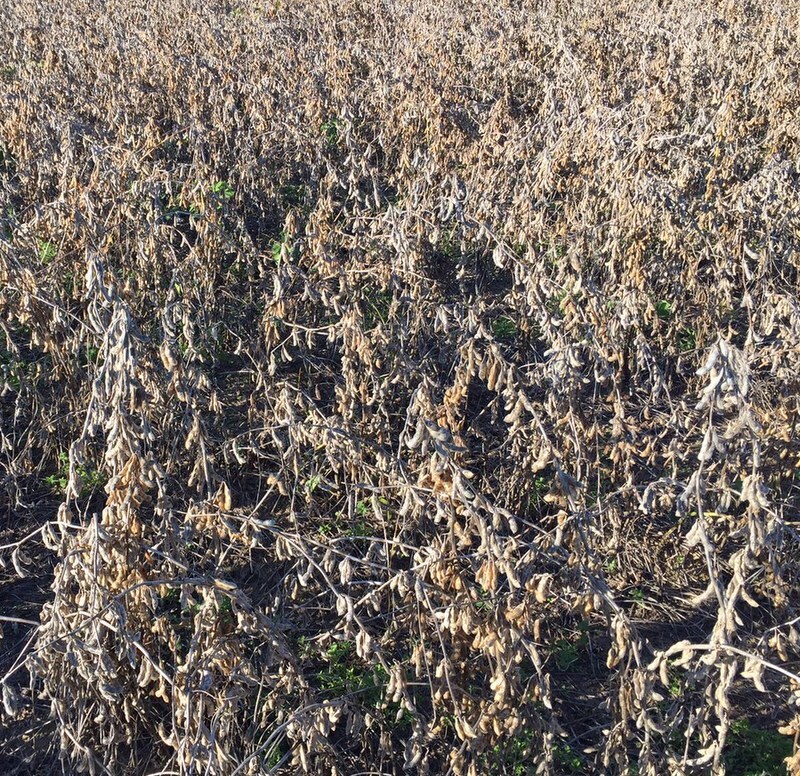 There is much to be learned about which ESSP varieties are best for South Georgia, but at present, it appears that indeterminate MG IV 4.6-MG 5.0 soybean varieties perform best for the management practices prescribed for this system. 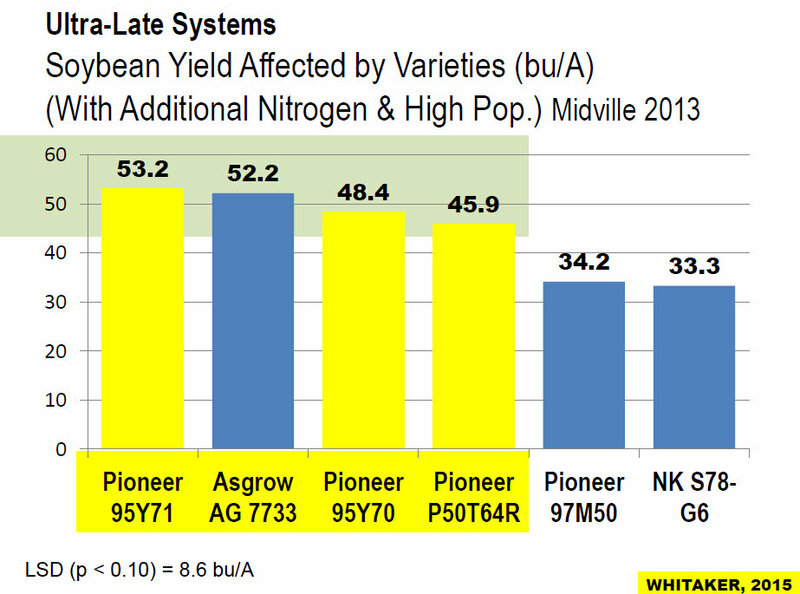 Not all MG IV varieties will have good seed quality when planted before early May. Check with seed companies to see which soybean varieties they recommend. 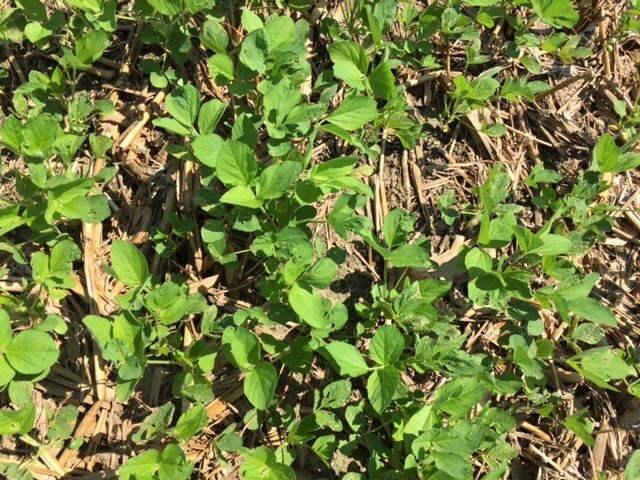 Control Weeds Early: Weed management strategies for ESSP should generally be no different than those for traditional full-season soybeans. 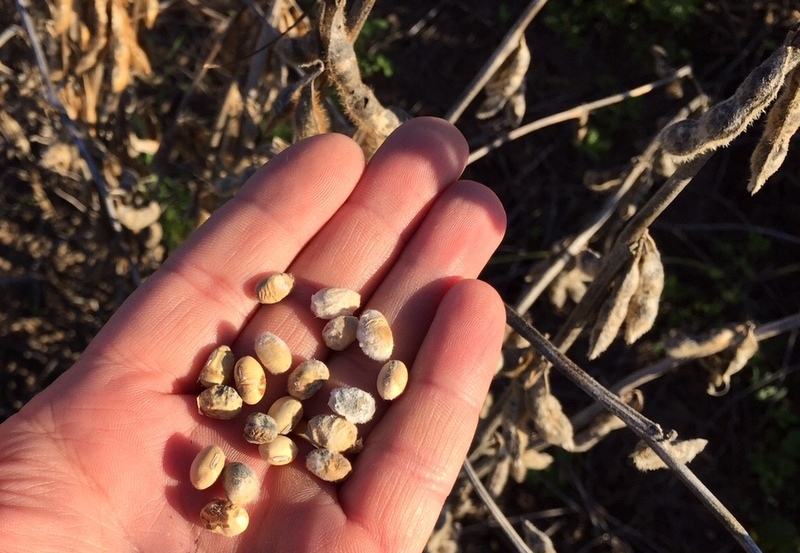 The one exception is that all weed management treatments, wherein possible, should be made before mid-June, the time when ESSP beans begin pod fill. There are high yielding Roundup Ready and Liberty Link ESSP soybean varieties. Select varieties with the herbicide tolerance trait that best fits your needs, and build a weed control program around them. The Georgia Extension Pest Management Guide is an excellent guide for developing weed management and other pest management strategies. Monitor and Control Insects and Diseases: Early planted soybeans will be a magnet for early season insects such as 3-cornered alfalfa hopper, kudzu bugs and stink bugs. 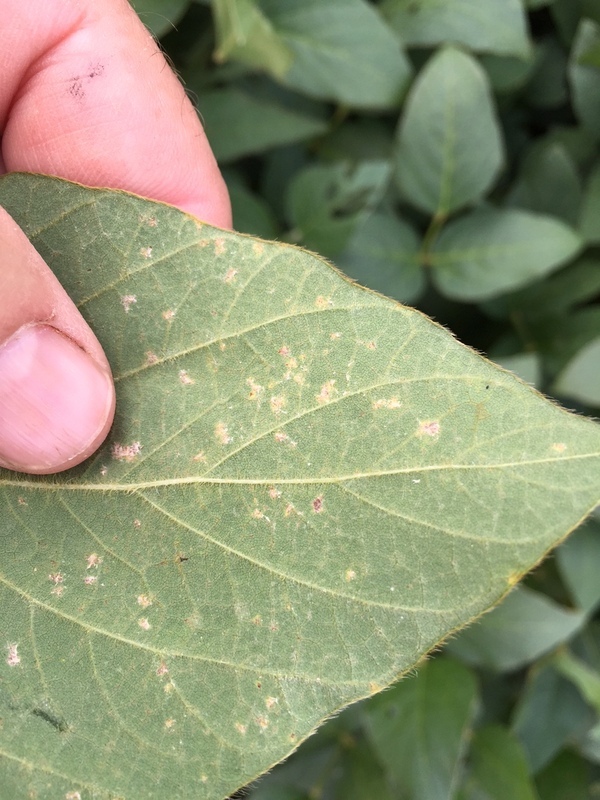 Begin scouting ESSP soybeans early and plan for control measures when economically damaging levels occur. Be especially watchful for pod feeding insects in mid-June since this is the time when pods will start forming. 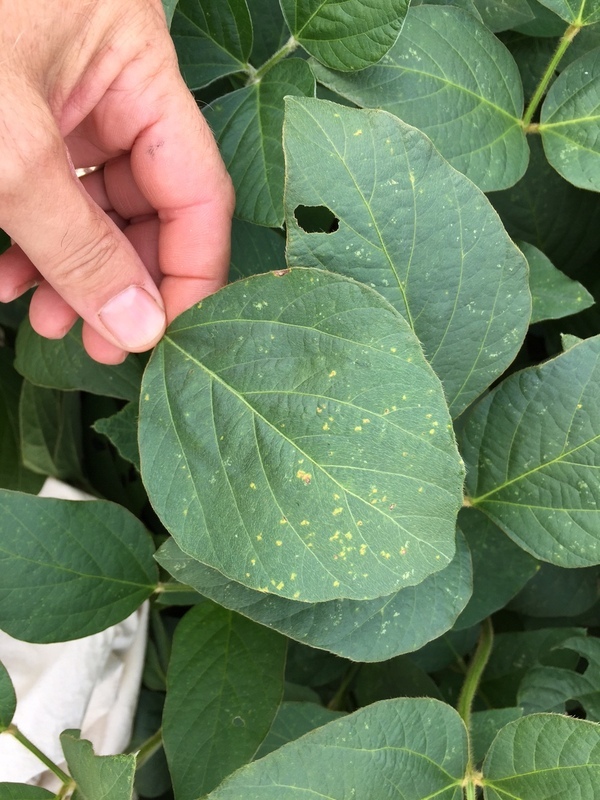 Keep in touch with UGA Extension Service for updates on the presence of soybean rust disease. At R3 (around mid-June), apply the protective Dimilin/boron/fungicide spray. Repeat this spray in mid-July, as many new unprotected leaves will have developed during this four week period. Continue scouting and apply any necessary control treatments until late August, the time of physiological maturity for ESSP. Irrigate as Needed for Good Growth and High Yield: ESSP soybeans are not recommended for dry land production in South Georgia due to risk of poor seed quality and/or low yields. The critical period (R3-R6.5) when ESSP beans must have adequate soil moisture for top performance is mid-June through early August. Plan to supplement rainfall with irrigation during this period so that soil moisture deficit is “zeroed out” every 3 to 5 days. In dry seasons, an irrigation application before or after this period may be needed. Use a soil moisture monitoring device to determine amount of water to apply for each application. Use a Harvest Aid After Physiological Maturity: This treatment helps get rapid dry down and the timely harvest critical to ESSP success. 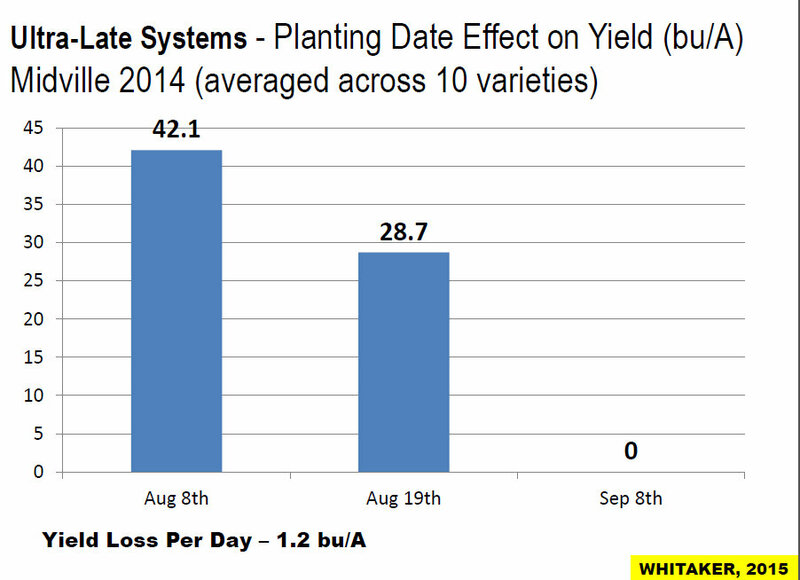 For early planted MG IV varieties, the timing for this treatment will usually be the last 10 days of August. Look for all soybean leaves and pods to have turned from dark green to very light green to yellow. Check uppermost pods (the youngest) to see if they have reached this stage. Be careful not to apply harvest aid too early as such cannot only reduce yield but also significantly reduce seed quality. 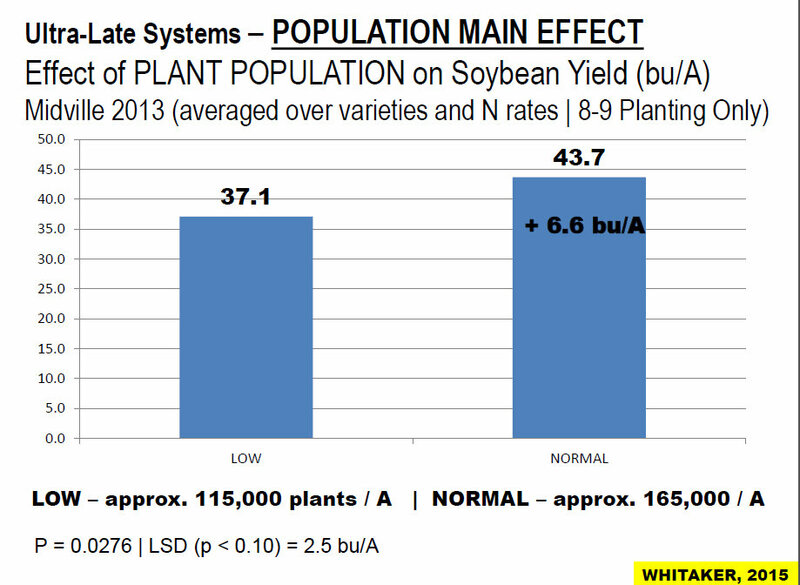 Remember, the soybean grain market is for yellow soybean seed. You can be docked for delivering premature green seed. See the UGA Pest Management Guide for harvest aid chemicals and application instructions. Plan for Timely Harvest: ESSP beans will be mature by early September, a time when day and night temperatures are usually warm enough that seed test weight and quality decline rapidly with extended field exposure. This will be especially true if frequent rains and/or high humidity continue after maturity. For this reason, plan harvest, wherein possible, by 10 days after dry down. Guidelines/Instructions for the above 10 steps are based on public and private sector studies from the Delta and Mid-South, personal Georgia studies, and farm trials with South Georgia growers. While ESSP field performance is usually good to excellent, individual field performance may not be good with adverse weather or circumstances. In comparison to traditional full-season soybeans, ESSP can have higher yields when these guidelines are followed, but also can have higher risks for poor performance if guidelines are not carefully followed. Our weather is warmer than normal but we aren’t planting peanuts like they are in Australia, although it feels like we could. I have an Australian fellow agronomist friend, Neil Halpin, who does research concerning peanuts and other crops. It’s funny that emails from there are often dated tomorrow’s date. Even right now it’s 9:19 in the morning here on Dec 14th, in his town of Bundaberg it’s already tomorrow, 12:19 am, Dec 15th. He visited us here several years ago. He was kind enough to send us this report concerning what’s happening there at planting time down under. 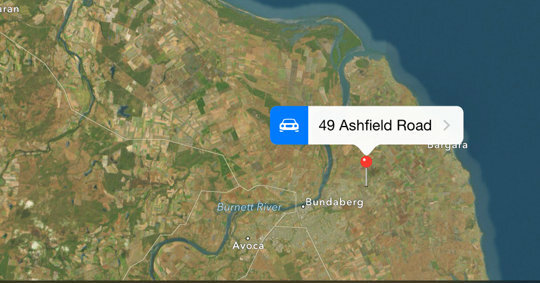 “The Coastal Burnett cropping area is located around the towns of Bundaberg, Childers and Maryborough in Queensland Australia. The cropping is dominated by sugarcane. 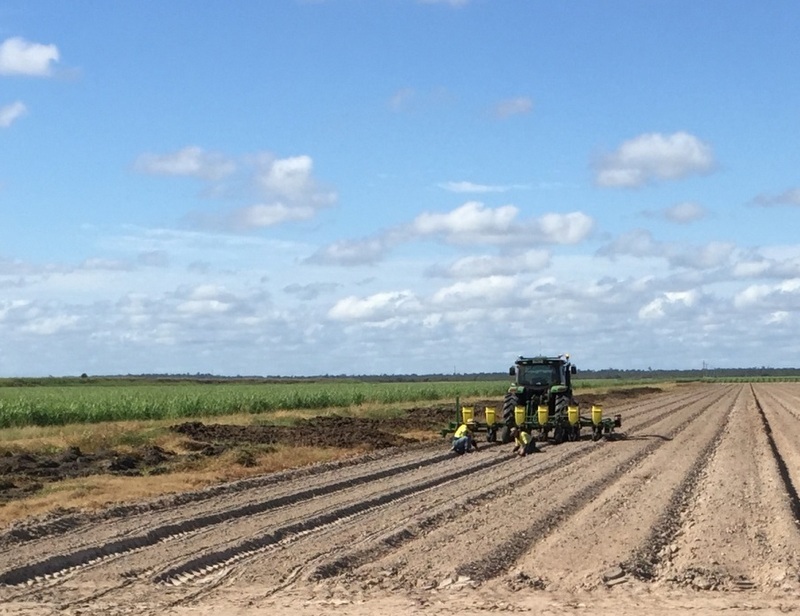 We have around 47,450ha (117,201 acres) of sugarcane. We also have about 5,800 ha of macadamia trees and about 1,000 ha of avocado trees as well in the region. Due to our sub-tropical climate we can grow a wide range of horticultural crops like tomatoes, capsicums and sweet potatoes to name a few. 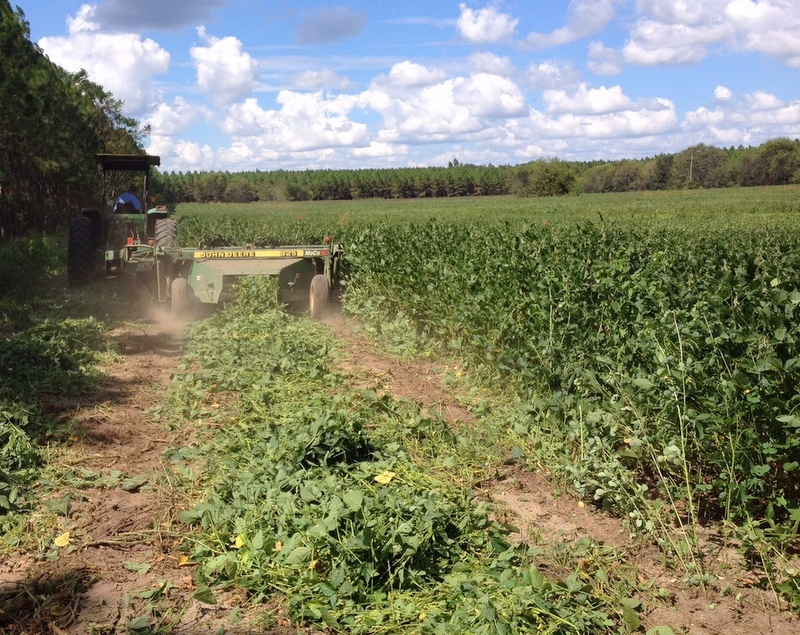 Peanuts and soybeans are an excellent rotation crop for sugarcane. We have at least 80% of our peanut crop planted. 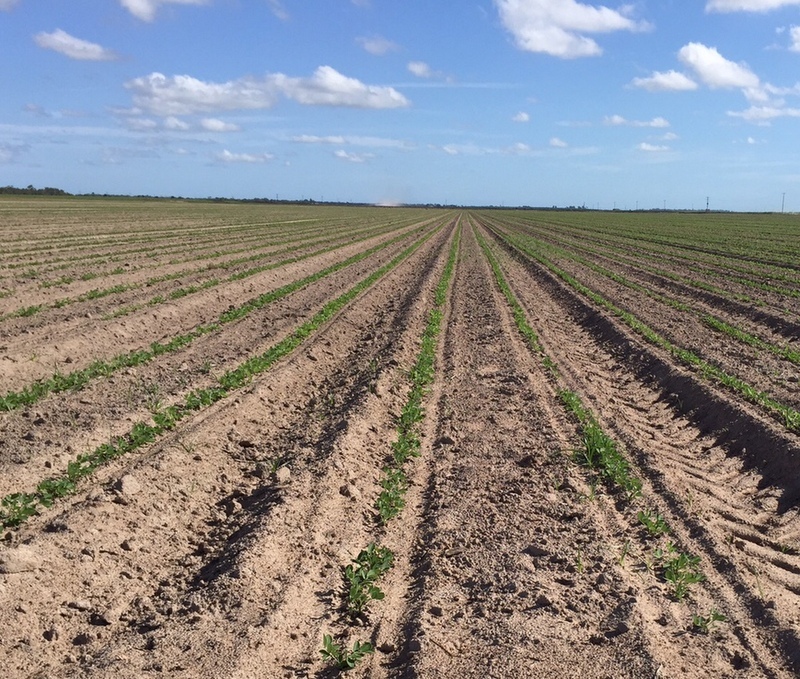 Our area planted to peanuts is down to around 1,000ha this season. The reduced planting is a result of a poor season last year where grades and therefore prices were very poor. Pictured below is a recently emerged crop, however some other crops in the district are 10 weeks old. We are expecting to have at least 2,000 ha sown to soybean this season. Some have been planted but many growers are waiting on some rain that is predicted in the next few days. Now is the ideal planting window for soybean so I hope we get lucky with the rain. Below are some growers inspecting the planting depth of their soybean seed. Our average rainfall is around 1,100mm or 44 inches. Whilst the rainfall is summer dominant many of our soils have low water holding capacity so irrigation is essential. 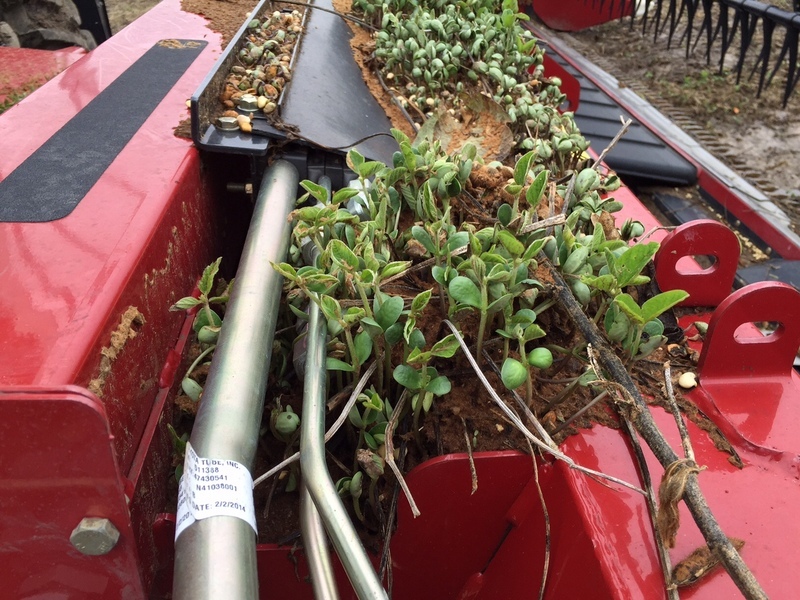 More attention to detail is generally paid to the peanut crop as it is a higher input crop. 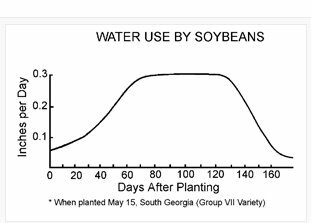 Due to the lower value of soybeans, growers tend to irrigate soybeans a little less frequently than peanut crops in our district. As a rough rule of thumb it costs us $200/ML to irrigate crops. Typically we would use 4ML/ha of irrigation on our peanut crops. A ML = 100mm (4 inches) on a hectare (2.47 acres). 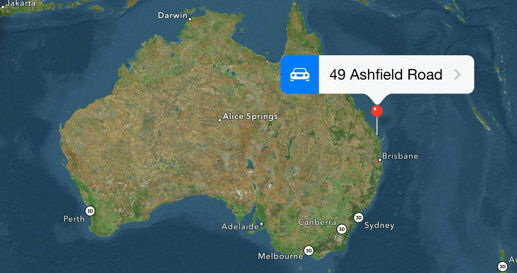 Here is where Neil is located. It’s time to get the soybeans out of the fields. We are having problems in some soybean fields with quality. The rainy, warm weather has really been bad for maturing soybeans. When we have high temperatures at harvest time, especially nightime, we get more degradation and problems. Also, we had too much rain on the soybeans that were almost ready to combine before the rains. The main problems are on the older beans, but we should quickly get them all out if possible. Here’s where a combine was harvesting soybeans and had to stop for the “rain delay” of almost 2 weeks and when going back to it the soybeans left on the combine were growing a new crop. Dryland or you could say rainfed soybeans are a risky proposition especially in sandy soil. 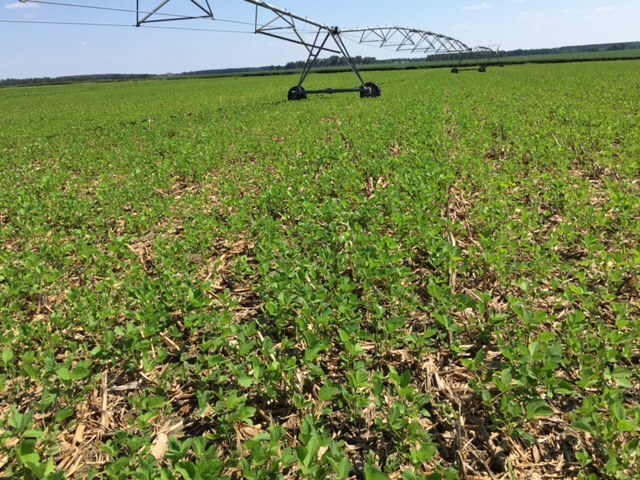 Soybeans need water when they need it for a good crop. Dryland yields in Georgia range from 5 to sometimes 50 bushels per acre and the main reason for this variation is water. Drought during the critical fruiting period really hurts yield. Local grower, Adam Hopkins, grew some pretty good soybeans this year without irrigation as you can see here. He will harvest them next week when it dries off. He said he got rain at the right times, on some fields. We are seeing some Downy mildew in several crops. I’ve seen it in vegetables and now in soybeans. It’s not usually a real problem in soybeans but it can be bad in vegetables. Here’s how the underside of the leaves look, with some fungal growth. 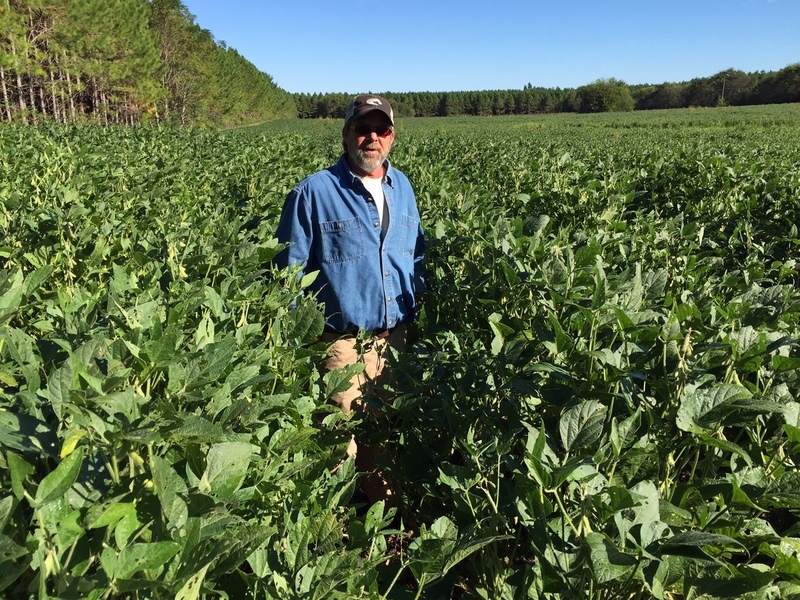 I was surprised this week when asked to look at some soybeans , I got to the field and the grower, Brad Trawick, said he was growing them for forage. They look real good. We have some photos here. Forage soybeans are typically harvested for hay or silage; however, they can be used for late summer temporary grazing. Since they do not regrow once defoliated, strip-grazing (or frontal grazing) is the most efficient use. Soybean forage is fairly digestible (up to 60 percent) and moderately high in CP (17 to 19 percent). Stem size can be reduced, thus increasing digestibility, if seeding rates of 90 to 120 lbs. of seed per acre are used. 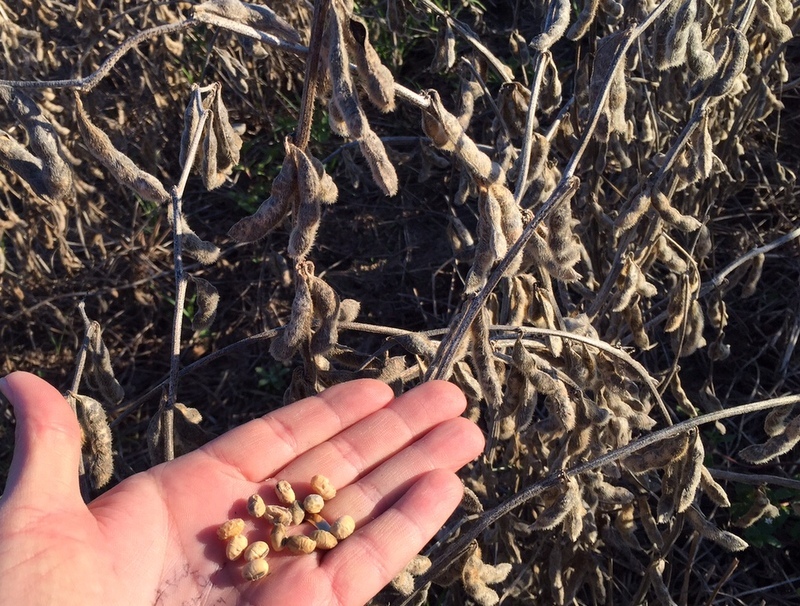 Planting late-maturing varieties (maturity groups 6, 7 or 8) from early May to early June will result in forage soybean production best suited for high yields. Shorter periods of growth, such as part of a double- or triple-crop system, can be accommodated with early-maturing varieties. However, productivity is expected to be substantially less. Dr. John Bernard,UGA Scientist, has the following advice. 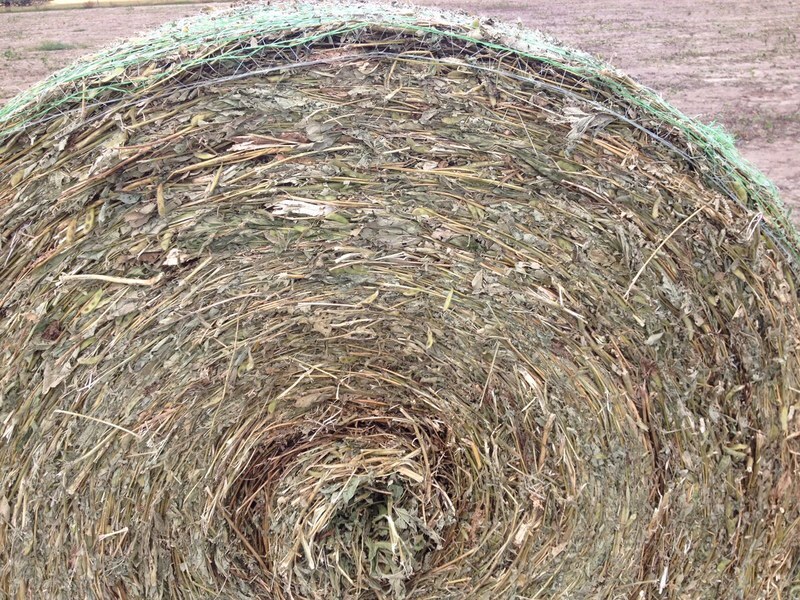 Forage soybean can work as silage and the leaf loss is significantly reduced, but the sugar content is limited making it harder to get a good fermentation. Certainly would benefit from using an inoculate when ensiled. 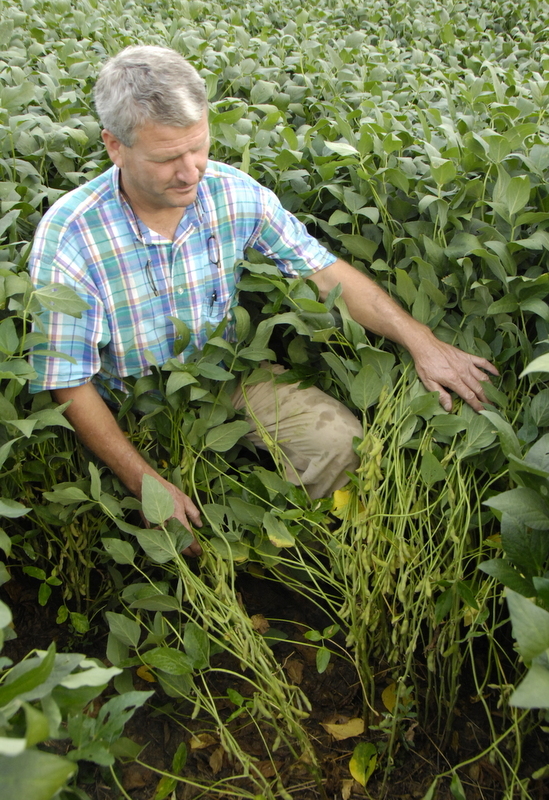 Soybeans has been one of those crops that gets some attention and then seems to fade away. Some have had good yields but others have not been satisfied with the yield compared with millet or sorghum. If used for hay it make a good hay that’s high in protein. It’s a challenge to let it dry enough so that it doesn’t go through a heat and even catch fire, but you need some moisture in it or you will loose the leaves and not get them into the bale. If it’s baled too quickly after cutting then it can heat up and the proteins can be bound and it won’t be as good a feed. A hay preservative such as Potassium Sorbate may be used to help with this problem. Using a mower that crimps the stalk will help, too. The stalk is often the hardest thing to get dry. 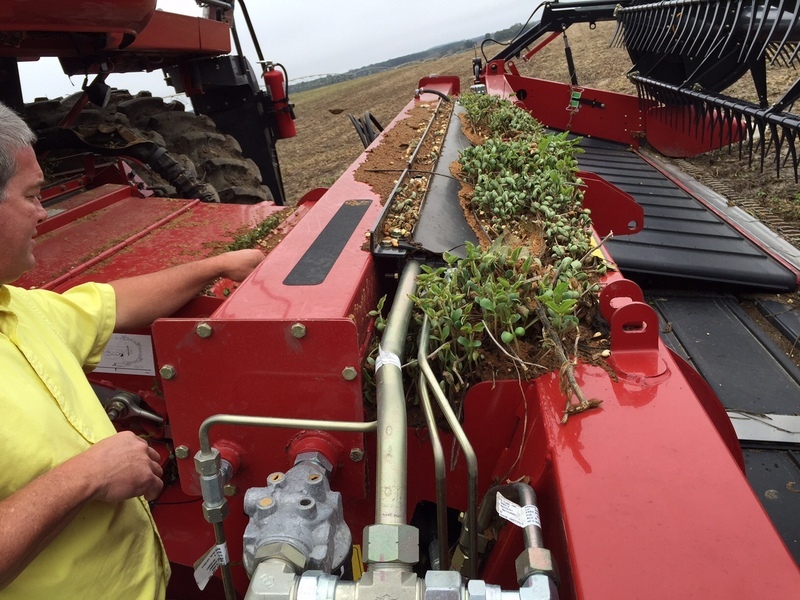 Perhaps mixing an annual grass with the soybeans when planting to help get the leaves into the baler without loosing them on the ground may help. Here is Greg Mims with some full season soybeans that are looking good. They are irrigated and have been well cared for. Caterpillars had to be controlled and a protective fungicide and foliar Boron have been applied. Now we will watch for any problems but mainly for stink bugs and other pod feeders. They are in a critical stage for water as well. 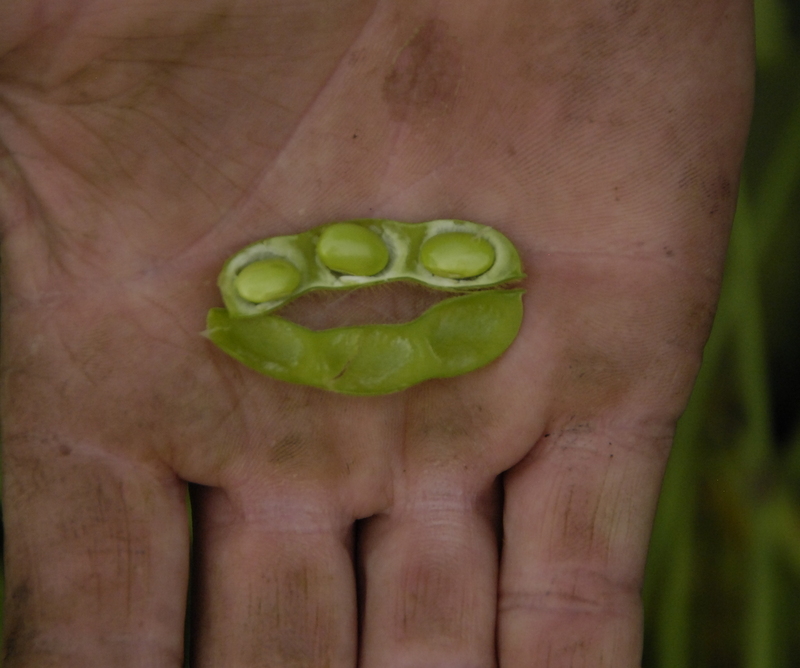 These soybeans are in the R5 (begining seed) stage , they will soon be at the Full pod or R6 growth stage. Flowering and therefore podding occurs first at the bottom of the plant and moves upwards. For purposes of naming the current growth stage, we only look at the 4 top nodes of the plant through stage 6 so we all stay on the same page. Here are some ultra late soybeans planted after corn harvest that are looking good. Herbicide controls worked well and fields are looking very green where before they had the tan old corn field look. Caterpillars have been in some fields but not all, some lesser (LCB) problems, especially in burned fields. There have been stand problems in some fields and some replanting has occurred. We need to watch fields closely for problems and keep them wet and growing for this is a short season crop. You can see that these plants are in their 2nd or third Trifoliate leaf stage, V2 or V3. This is important to notice due to some herbicide application times. In some cases the soybean plants need to have trifoliate leaves in order for certain herbicides to be applied. 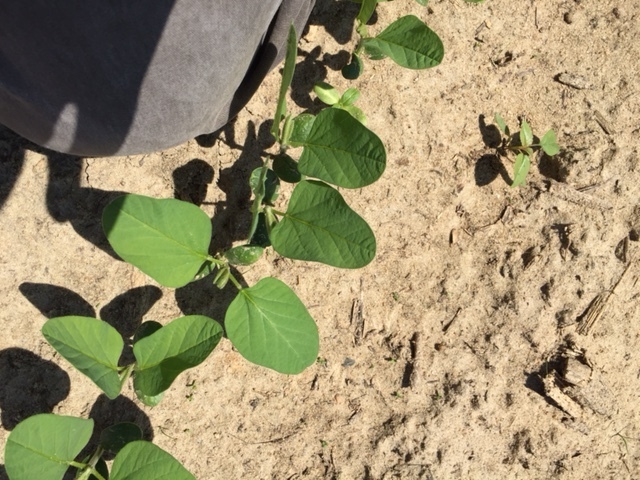 These soybeans below are younger and they are in the unifoliate (VC) stage. I guess unifoliate is kind of like unicycle… single leaf…single wheel. The next leaf to come on the soybeans will have three parts to it or trifoliate. Ultra late soybeans after corn are being planted now and getting them in early will help yields. Here are some links to past information I’ve posted about this subject. 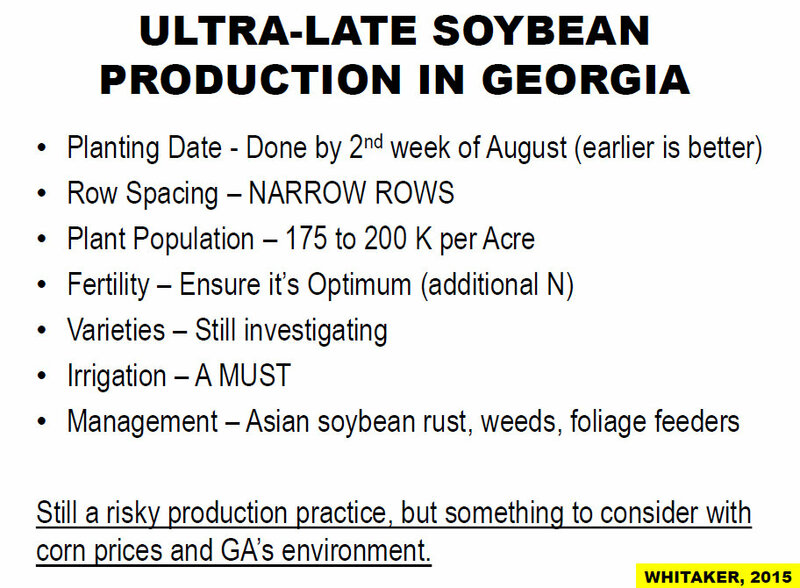 Here’s some good information from UGA Soybean and Cotton Scientist, Dr. Jared Whittaker, concerning Ultra Late soybeans. Some of these charts represent only one year of data and so we know we could get different results if averaged over several years however it’s still good information and these results follow what we’ve experienced. 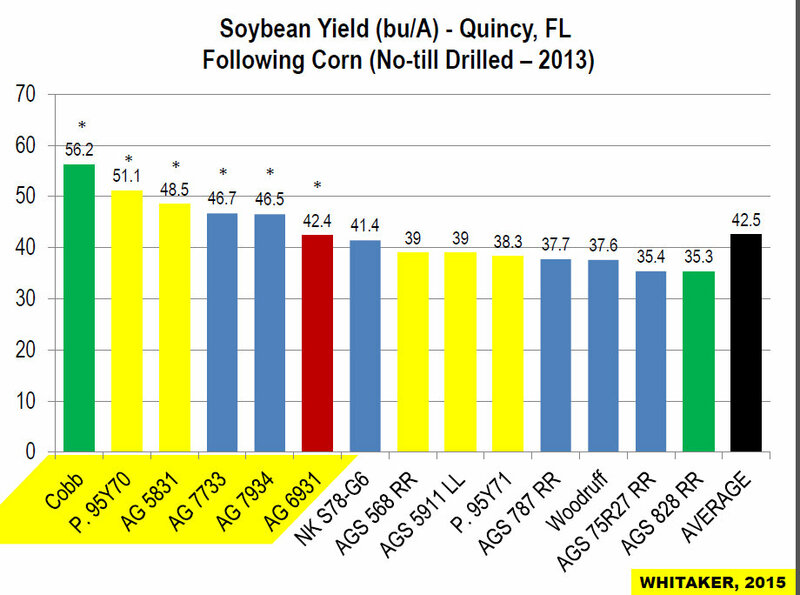 It’s important to know that in some years we don’t get these yields. Weather affects this a lot.